Japanese chemists have looped glucopyranose sugars into the smallest ever cyclodextrin rings, containing just three and four sugar units. Previously, scientists thought such structures impossible because the rings would be under too much strain, explains Hidetoshi Yamada at Kwansei Gakuin University. But now his team has revealed ‘the proven existence of the cyclic trimer and tetramer’, Yamada tells Chemistry World. Chemists have previously made three-unit sugar rings, but cyclodextrins are special structures that can trap small molecules and are also harder to synthesise. They are made only of linked smaller ring structures, known as d-glucopyranoside sugars, usually with six–eight units in the larger cyclodextrin ring. 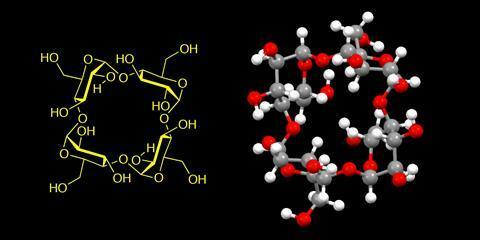 And while each sugar has several hydroxyl groups that could link together, they consistently bond to the next one in the cyclodextrin ring in the same way. Yamada had been interested in rings containing few sugar units since the early 1990s, but forgot about them for a long time. However he became curious about whether three and four-sugar cyclodextrins could exist again after his team synthesised what they call supple glucopyranose rings. They had designed a chemical bridge connecting two of d-glucopyranoside’s hydroxyl groups, which deform the pyranose structure from its innate, most stable form. That suppleness means these smaller rings take the right shape to connect together into cyclodextrin rings. However, the Kwansei Gakuin University chemists had to use careful protecting group strategies to ensure the glucopyranose units connected in the correct orientation. That’s a big contrast to how more common cyclodextrins are readily made from starch using enzymes. Developing that approach took around a century from their first discovery, Yamada notes. He adds that the three- and four-member cyclodextrins are newborn, and asks that people look at them ‘with warm eyes’. Narayanaswamy Jayaraman, a synthetic organic chemistry from the Indian Institute of Science Bangalore, calls this achievement ‘of utmost importance to carbohydrate research at large’. He notes that controlling sugars’ conformational preferences like this can help connect them together with ‘complete stereochemical control’. 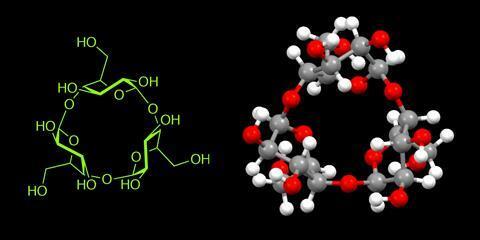 ‘The work is exemplary,’ he says and ‘represents a breakthrough’ in cyclodextrin synthesis. ‘The approach will have a profound influence on glycoside bond formation in several other circumstances also,’ Jayaraman adds. Yamada now wants to provide the small cyclodextrins to other researchers who might find uses for them, hoping that they quickly find valuable applications. But first his team needs to improve their synthetic route to be able to produce gram quantities.